Lean Biologix is a unique service provider for FDA regulated manufacturers. We collaborate with our clients' internal resources to manage and execute projects that have a lasting impact. We provide on-time delivery and focus not only on project completion but sustainability. We leverage technology and lean principles to deliver efficient and manageable solutions to our clients’ most pressing problems. Over the course of time, Lean Biologix has created innovative tools in order to complete projects with the highest degree of efficiency. We've refined some of our tools and developed them into products that can be applied across the industry. We built a multi-faceted program that ties directly into our client's CMMS to handle automatic part kitting, PM part forecasting, current part demand, and more. With the many needs of a GMP warehouse, customization is key. Keeping an accurate inventory and control of maintenance for lab instruments can be challenging. We built a custom application for one of our clients that reduced the inventory process time and eliminated the errors of a manual walk-down. Have you ever felt like the documents you write every day were formulaic? We had the same feeling, so we made an automatic script writer to cut down on creation and review time. Most PDFs prevent you from easily editing or copying data. We made a program that does the job for you. In order to install and use a piece of equipment in a heavily regulated setting with plenty of rules and policies, it needs to be properly validated. Our tool helps you do just that. The Advanced Parts Manager, better known by its users as the Kit Labeling program, was first conceived as an idea to improve a client's process in kitting and labeling parts. The client originally sent out parts individually by request of the mechanic, rather than sending out all necessary parts depending on the equipment being serviced. Our client continues to use this product today and has saved time and money over the years through our efforts. The Automated Script Writer was first intended as a small, in-house project to help our IT documentation team write and create test scripts. Our team was used to creating these test scripts from templates, creating tables in word documents by hand and often subjecting themselves to error which resulted in Test Incident Reports, in the worst case. Our team has been happy with this automated writer, and has even sent the program out to be used by our clients who partake in a similar test script drafting process. 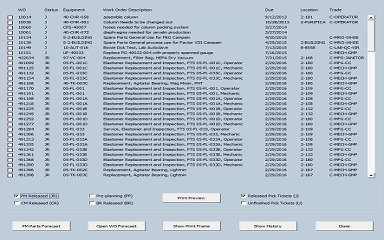 The Asset Inventory Tool was created for our client within a 2 month period in order to meet their Inventory needs. The original tool was written in VBA and ran as an Excel Macro which was effective, but full of prompts, resulting in a clunky user experience. This recent iteration is an improvement from the original: the process has been streamlined, the program has been ported over into an executable, and additional features have been added to provide traceability and other necessary functions needed for an effective inventory process. The PDF Parser is a program used to demo PDF parsing functionality. The program takes in a text-based PDF and parses the data, outputting the text to a text file, excel file, or other applciations. This program was put together as a demo for a client who required an automated process to their current manual process of getting data from PDFs. The Validation Formatter is a tool used to validate equipment for regulatory use. This was put together for a client who had dozens of new equipment coming in for installation, which needed to be validated before being used. The demo uses data from temperature controllers set up in a new freezer which kept track of its temperature throughout the day, and generates graphs to show the user a visualization of the data. This tool was created for our client a few years ago, and we at LBX are happy to say that it sees continued use today. At Lean Biologix we focus on many areas of the manufacturing process. We believe that the application of a science-based approach is the best method to identify improvement opportunities in any process. We rely on data analysis and best practices benchmarking to discover the root cause of problems. We implement solutions that streamline processes, and, where applicable, develop custom software solutions.